It's April 1st! Get Ready Ya'll! Just Announced! "In an effort to keep up with the ever-popular "chocolate wonderfall" fountains of Golden Corral, The Hot Chocolatier of Chattanooga has teamed up with a local pool company to produce what may be the most innovative chocolate experience this side of the Atlantic Ocean. Owners, Wendy and Brandon Buckner, claim that this venture came to them while working in the kitchen late one night as an unsold milk chocolate shape of the bow-and-arrow carrying cupid was being melted down for use in a recipe. "We saw him smiling as he melted into the pool of dark chocolate and yelled out loud almost at the same time, 'Who could resist a pool filled with chocolate!?' The next day we called up a local pool company to ask if it could be done and they said, "Sure, why not?" This is the first time we've EVER seen it done within a shop where customers can bring their kids in and let them frolic in a pool of chocolate." According to the Buckners, however, there's not a lifeguard on duty. "We just can't afford it after all the expense we've put into building this thing, so it's a 'play-at-your-own-risk' type of thing for now," says Mr. Buckner. He goes on to add, "I mean, parents are invited to put on their trunks and jump right in as well; it's a family type of thing that we figured Chattanoogans would love. We have the fountains at the Aquarium, so we wanted to bring it to the Southside of town." 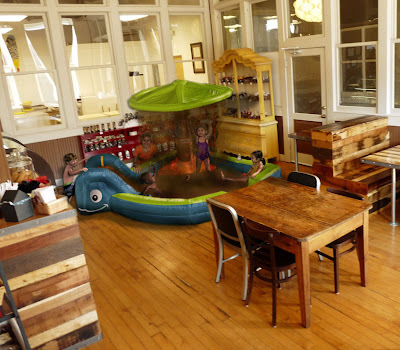 There's already rumors of a giant chocolate park in the works for an undisclosed Southside block. "We've had lots of interests from people who want to really put Chattanooga on the map," says Mrs. Buckner. According to the Buckners, a Kickstarter campaign has been started by supporters of the project. "I think it may be up to fifty bucks or so by now," says Mr. Buckner. "But the thing has really just gotten off the ground." Look for a giant Olympic sized pool complete with slides and waves in the future for Chattanooga's landscape. "We're so excited about what this means for this area's growth," says Mrs. Buckner." Mr. Buckner goes onto add, "I mean, this is a year round thing, just think of it! Swimming in the summer while the chocolate is melted, and then skating in the winter when it cools down and becomes a solid block! I can't wait!"